CAPE TOWN, South Africa (CNS) — South African President Jacob Zuma should show ethical leadership and take some responsibility for the excessive expenditure on his private residence, church officials said. “We wish to remind our political leaders that, at a time when millions of our people are struggling to make ends meet, it is morally unjustifiable for the government to spend excessive amounts” on “one person and on nonsecurity items,” said the Southern African Catholic Bishops’ Conference justice and peace commission. Aside from obvious security features such as accommodation for security staff, fencing and a helicopter pad, the upgrades included a visitor center, swimming pool, cattle enclosure, chicken run and amphitheater. 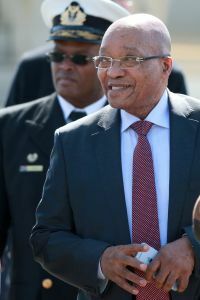 Zuma was absolved of any wrongdoing in a May 28 report prepared by a parliamentary committee established to consider whether the president unduly benefited from more than $20 million in upgrades at his rural residence in Nkandla. “We are also concerned with the far-reaching impact that the Nkandla project will have on the national efforts to end corruption and achieve moral regeneration,” the justice and peace commission said in a June 2 statement signed by its chairman, Bishop Abel Gabuza of Kimberley. The latest report runs contrary to a 2014 state watchdog agency report that said Zuma and his family had unduly benefited from several nonsecurity feature upgrades. The justice and peace commission said it “notes with dismay” the committee’s findings that Zuma should not have to repay the money spent on these upgrades. “We strongly appeal to the government to make sure that the Nkandla saga does not diminish the capacity of the office of the public protector to fight corruption,” the justice and peace commission said.